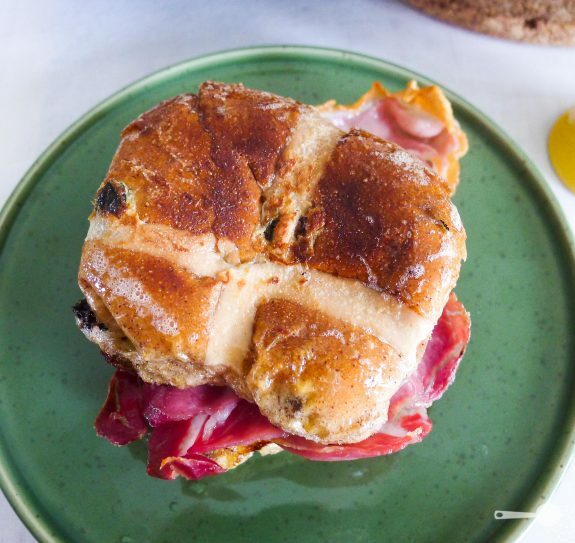 Wow, I bet you didn’t see this one coming… But does the combination of cured pork and fruit bun really work? If you have ever tasted salted caramel anything you’ll know what I am talking about… It works a treat! I needed to get my hands on some bunny goodness, pronto! For a good couple of weeks now Bakers Delight, my favourite bakery and to go store for lovely Vienna sourdough, have been busy churning out gorgeous, fluffy, fragrant and, this bit makes me the most happy, preservative-free hot cross buns for our enjoyment. Their buns are baked fresh daily and come in a traditional spice and fruit flavour as well as a chocolate chip and mocha flavour comibinations. I prefer the traditional fruit and spice bun that, even though I didn’t grow up with them, has now become my true reminder of Easter. While the recipe works well with fresh buns, it was traditionally used for refreshing slightly stale bread, providing a perfectly delicious excuse to use up any left overs. Instead of throwing them away, transform your hot cross buns into flavourful French toast served with crispy prosciutto and maple syrup. A decadent Easter Sunday brunch snack that will leave you wishing you’d let more buns go stale! And don’t forget that the Bakers Delight’s “Bundraiser” is on this Saturday, 9 April, with stores across Australia and New Zealand preparing to bake over 520,000 fresh hot cross buns to raise money for sick children at hospitals across the two countries. $1 from every six-pack sold will be donated to the cause. So, find your nearest store here and go get yourselves some buns! This recipe works just as well with fruit or raisin toast bread, or even fruity sourdough. It’s a great way to refresh day old buns or stale bread. Like the green egg shell in this photo? Stay tuned as I’ll be showing you how to make your eggs more festive in all the colours of the rainbow over the coming weeks. Cut hot cross bun in half. Mix egg with milk. Dip each bun half in the milk to cover well and soak up some of the egg, flip and repeat on the other side. Place prosciutto slices on parchment paper and grill on high for a couple of minutes, or until crispy. Heat butter in a frypan on medium heat and fry bun halves on each side until golden. Serve buns topped with bacon and drizzled with a little maple syrup. I’m going to make this toot sweet… I guess it would work with raisin toast when HCB’s are unavailable. Yep, definitely! Raisin toast, fruitty sourdough, I may even go as far as saying that it would work with the choc chip versions. French use cocoa to cook meat in, so why not?? There’s something oddly, wonderfully, richly, crazily fun about combining meat with sweets. One of our decadent brunch places down here (live in the South) serves a chocolate French toast with a peanut butter syrup, bananas and BACON. Thick bacon at that. So good! You are welcome, I’m saving myself till then for the next lot.